Home » City Information » Day 11: Totally worth the wait. today’s fika experience was a little bit different. i had it all planned out. (mistake number 1). 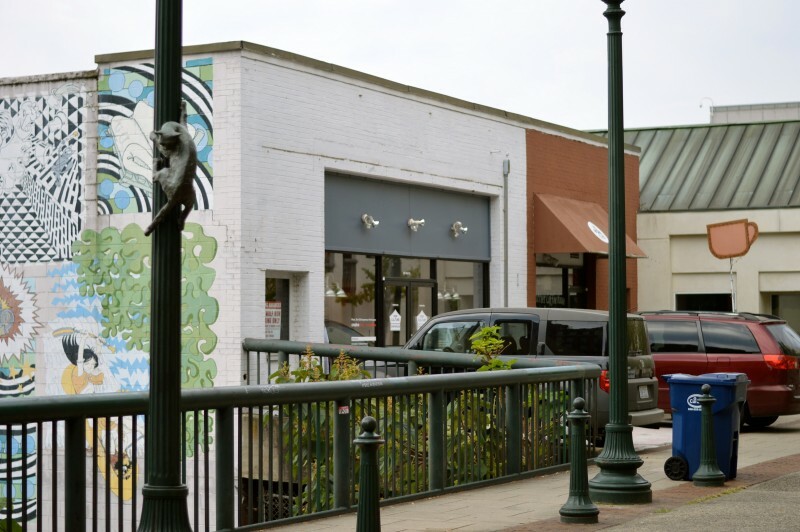 i knew well in advance where i was going to go, so i drove downtown, parked in the parking deck, and descended the stairs from the grove arcade area to wall street. 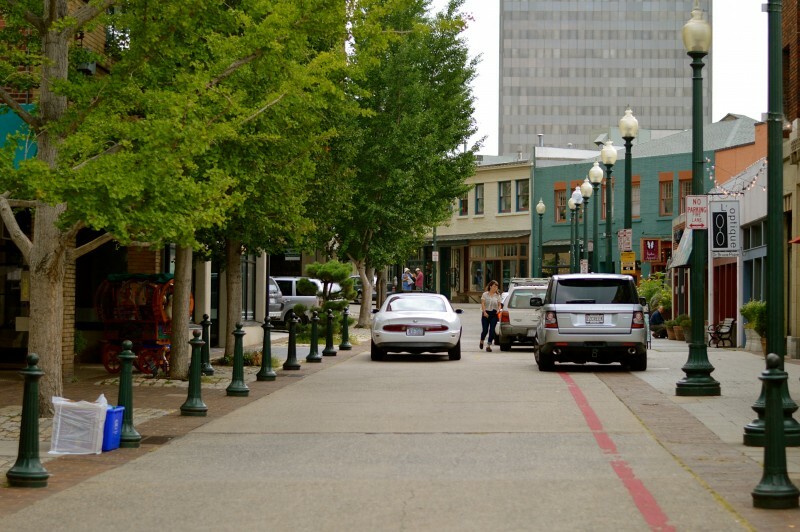 yes, asheville has a wall street – like nyc. only not at all like nyc. 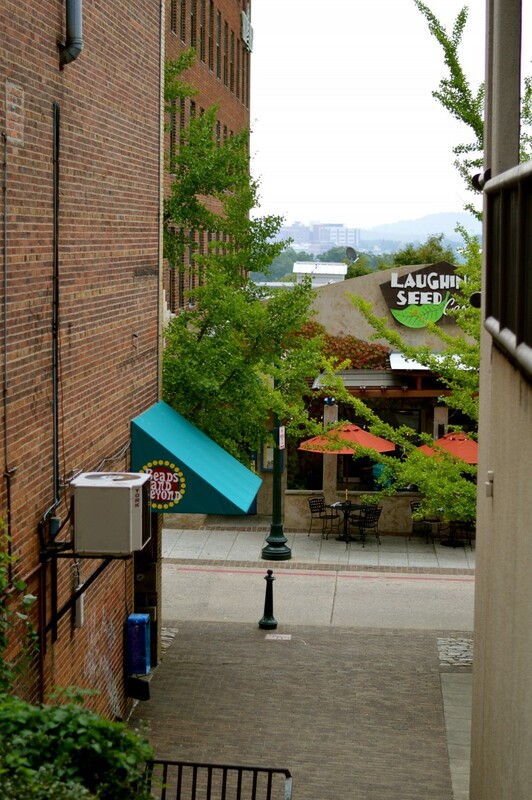 asheville’s wall street is really cool i think. 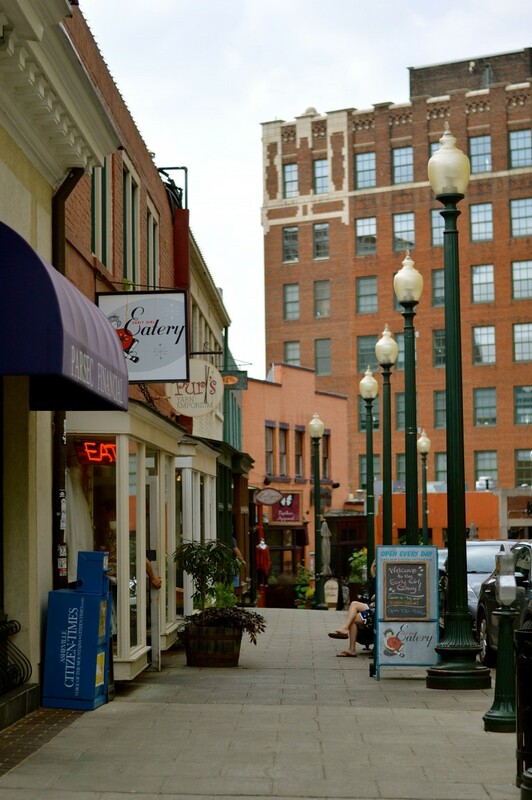 it’s lined with independent stores and vegetarian restaurants/cafes. it’s a tiny, short street. almost like an alley-way. and from what i understand historically, it was a back alley once, where deliveries were made. 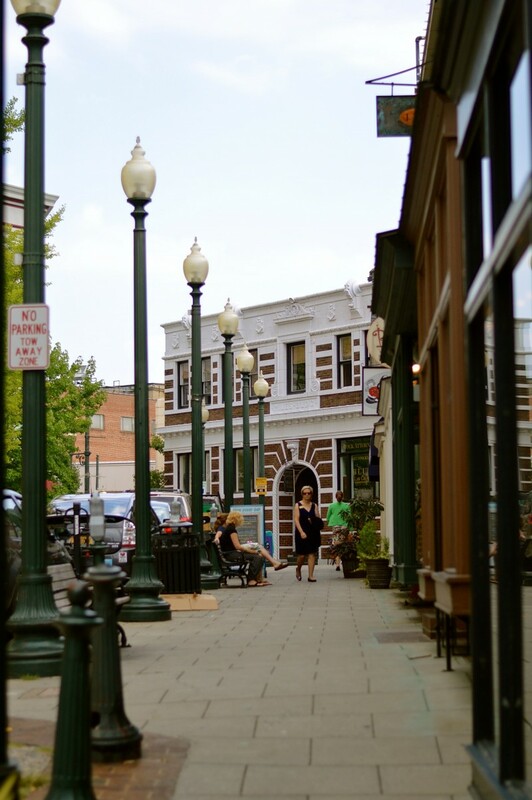 the shops & cafes on this cute street are actually the backs of other, bigger businesses which line one of the main streets going through downtown asheville. so, while it could have been a forgotten area, funky little places have popped up and are doing pretty darn well, for the most part. 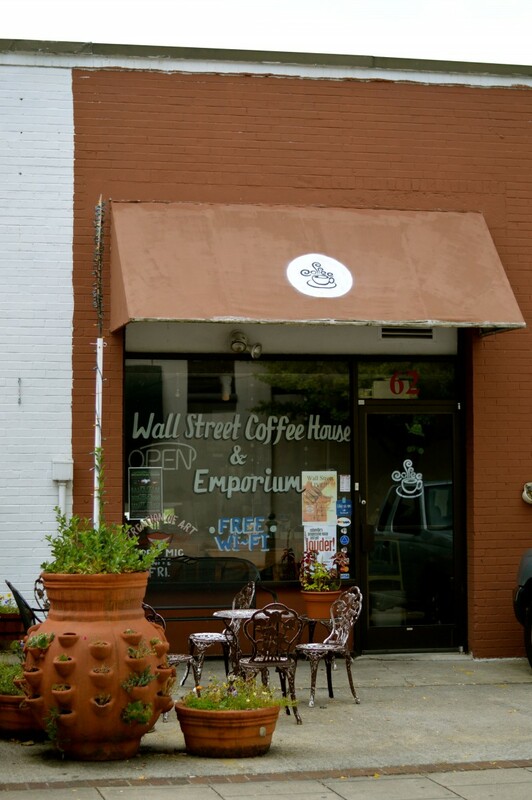 i was on the hunt for a little cafe called wall street coffeehouse. i had never heard of it, much less seen it. after strolling up & down wall street 2 times, i decided to take a peek at my phone to get the street number of the cafe. ah ha. i hadn’t even passed it yet… it was a little further down from where i had wandered. a little bit past the main area of wall street. no biggie. it was just a few more steps passed these cute little kitties that decorate one area of wall street… a little art in remembrance of the historical story behind the name of the street. you see, as i said before, wall street used to be an alley fro deliveries, and this space, where the fence is in the second photo below, is on the top of a wall that was built to keep the hill above from falling down onto the buildings below. ya gotta love mountain architecture. and back in the day, the doorways on wall street could only be reached by a catwalk, hence the little kitty statues you see. interesting trivia, huh? 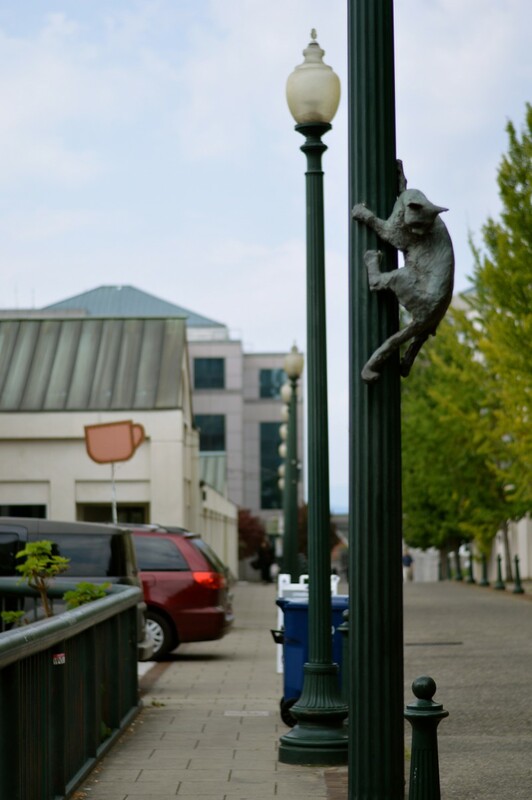 just beyond the cat on the pole, i noticed a coffee cup sign and figured that it had to be my place. i walked across the street and shot some photos of the outside, and then made my way to the door. i was definitely craving some coffee by now. from the outside, the cafe looked pretty tiny. cozy, i thought. and it felt a little more local, not so touristy or chain-y, which is always a good thing in my book. it also looked a little dark inside. hmm… one quick look at the hours on the window, and my suspicions were confirmed: closed. well, damn. however, it would open in an hour, which would still give me time to at least try it out, but i’d have to kill and hour and not spend as much time as i’d like. what to do, what to do? 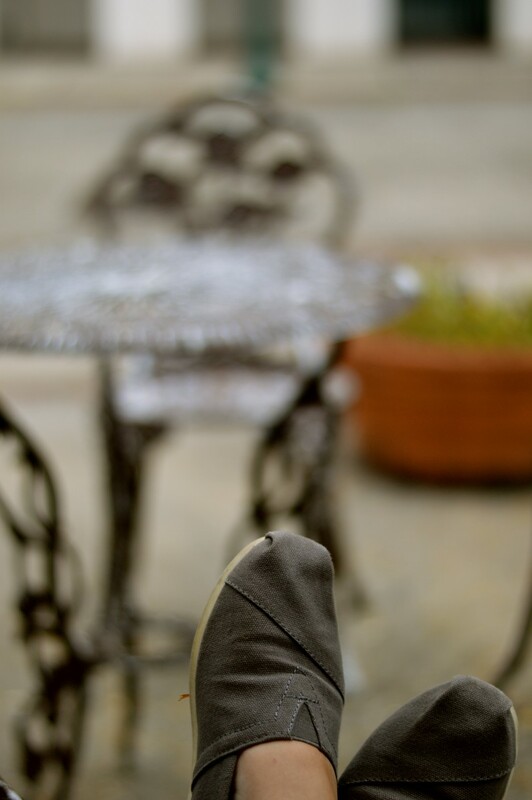 i sat down on a chair on the cute outdoor furniture and watched some birdies play while i decided what to do. it was really nice to just sit there. people walked by, but otherwise, i felt as if i’d found a little secret, out-of-the-way place. after some time, i decided i was hungry, so i went up the hill and grabbed a bite to eat. after lunch, i headed back to the coffeehouse and knocked on the door. i asked the lady who answered if i could come in. she warned me that she wasn’t quite ready to open yet, but that i was welcome. i told her i just wanted some regular coffee and to sit down. 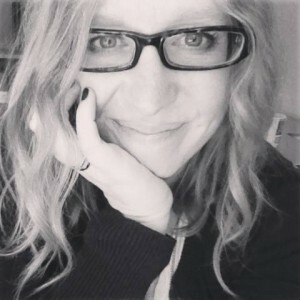 then, i shared with her about this 40 days of fika project, what i’m up to, and such. i also asked if i could take photos of the place. theresa, the lady, said she’d rather me not take photos of the art on the walls, and then, she explained that it might be pointless to take photos of the rooms/space because she would be moving where her lease is up. i admit i was a a little disappointed, but i completely understood and respected her wishes. so, today instead of getting all wrapped up in taking photos, i wrote down what i saw. i talked to theresa, and i just let the place sink in. do you know the definition of a coffeehouse? well, it’s not starbucks. i mean, starbucks is a house of coffee, but let’s get back to the original definition of a coffeehouse… like the kind you’d find in grreenwich village in the 50s, 60s and 70s. a coffeehouse is place of social interaction. during the beat generation, it was a place for open mic nights. there has been a link between coffeehouses, folk music, poetry slams, book clubs, free expression, art, and social & political action. 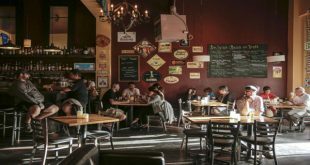 instead of just being a place to grab coffee and either chat with someone or sit alone & read, true coffeehouses (in my opinion) have an element of community, and seek to be active in society. if you know anything about me, you know that this right up my freaking alley. this is what i’m all about. coffee. conversation. social/political action. literature. music. art. a coffeehouse combines all of my passions into one place. and that is exactly what this place is. the art on the walls that i couldn’t photograph? it was done by homeless people, regular people, amateurs. the tiny cafe that i thought this was, opened up behind the coffee bar into a huge gathering space, filled with sofas and coffee tables and other second-hand furniture. there were games and books. and as i talked with theresa, i learned that the coffeehouse is open from 1-9 or 1-11 (in the evenings) because there is community, social stuff happening there. like meetings. and groups. open mic nights. art shows. wall street cafe is a safe place, a place for people on the fringe of society. a place for those who may be struggling and need a sense of community and belonging. a place to learn and to be creative. and, of course, a place to just sit and be and philosophize. it’s not flashy or fancy. it’s very simple, but filled with meaning. it’s not just a cafe with tables. in fact, it’s not really that at all. it’s a place for resources, for inspiration, for action, for connection. i was freaking out with excitement as i talked with theresa and learned more about wall street coffeehouse. overwhelmed and astonished at her sheer love for what she does. as we chatted, we discovered that we could relate to each other in our current lives. as i mentioned before, her lease is up soon, and she i looking to move to another location. 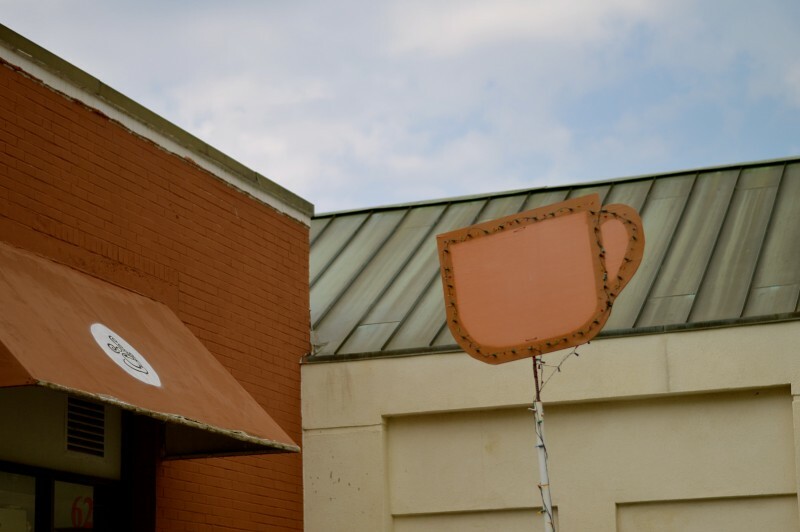 she has no idea where, or what’s in store for her, or for the coffeehouse community she has built up. i personally think some organizations and business need to get behind her and help her financially. i didn’t even meet any of the people that hang out there, but i know she is making a difference. i could see it and feel it. we decided that we’d stay in contact with each other, and, at the least, offer each other support and pep each other up… reminding ourselves that whatever the universe has in store for us, all will be well. and it will be exactly as it should be. unfortunately, i couldn’t stay very long , and just as i was settling in, it was time for me to go. it felt really great to meet theresa and to know that we’d keep in contact with each other. we exchanged contact info., and just before i was about the walk out the door, she invited me to teach some classes there, if i wanted. WHAT?! i could hardly believe my ears. in a sense, it was an offer for me to create some small groups to teach whatever i feel that i can offer/is needed. this was (and is) overwhelming to me. it’s like a dream. of course, there is still no money in it. gaaaahh. money is so unbelievably annoying. 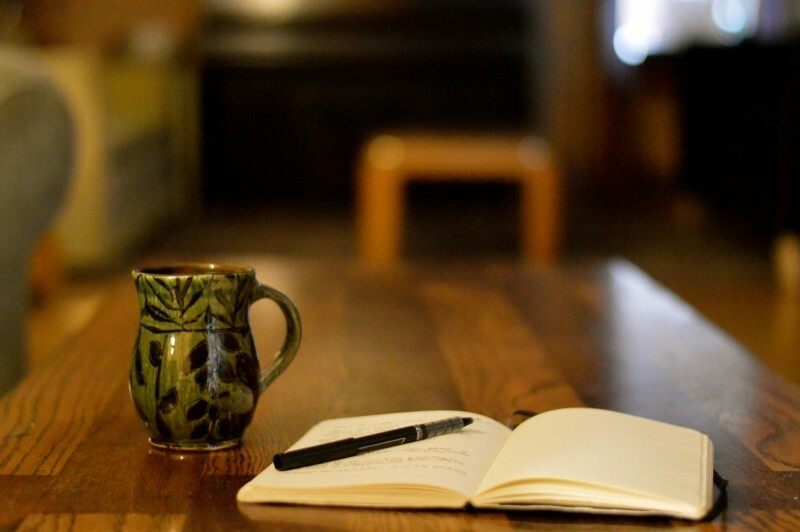 still, to have a chance to use my gifts, to give back, to connect with people, and to use this coffeehouse as a meeting place… it is an amazing opportunity. like. amazing. so, i’m gonna spend the rest of this week planning, thinking, and searching. i think i’ll probably stop back by the wall street coffeehouse one more time this week as well. if you live in asheville, you should too. even though it was closed when i first got there, and i had an hour to kill, it was totally worth the wait. and it’ll be worth the wait to se what happens to it as well. i’ll be sure to keep you informed and let you know when they move. Next Day 12: Right in the middle of it all.